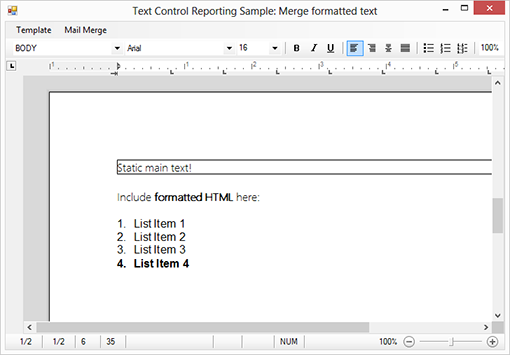 The basic concept of Text Control Reporting is to keep the text formatting in templates and to merge plain text values into the final report. The string format can be adjusted in the field properties to add currency symbols or to define the number of decimal places. Sometimes, formatted text should be added to parts of a document. Generally, the key concept for this purpose would be an INCLUDETEXT field where sub-templates can be merged into master templates. But consider applications, where HTML formatted text is stored in database fields and not in physical sub-templates. TX Text Control's MailMerge component provides a very flexible event handling that enables you to change the field text during the merge process. This tutorial shows how to create templates with fields that are merged with formatted HTML from an XML data source. In the element company_description, HTML code is included in a CDATA section that should not be parsed by the XML parser of DataSet. 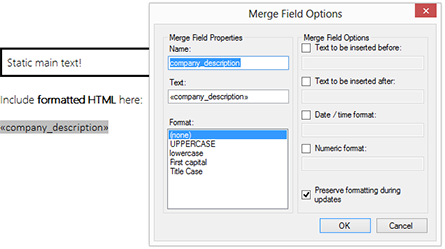 In the template, a merge field with the name company_description is added. The switch Preserve formatting during updates is used to indicate that this field contains HTML text. The event FieldMerged is raised for each successful merge of a single field. In this event, we will check for the Preserve formatting during updates switch which is accessible through the MergeField.PreserveFormatting property. If this flag is set to true, the field content is loaded as HTML into a temporary ServerTextControl and then returned as formatted text to the event argument e.MergedField.